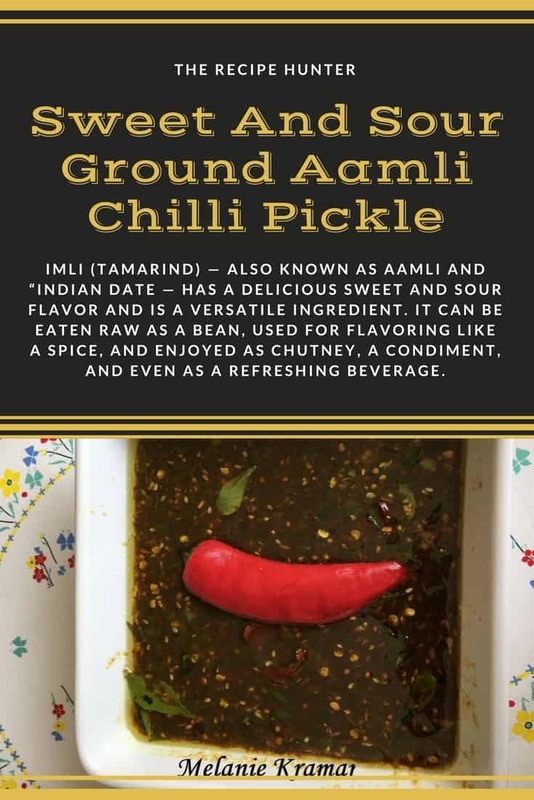 Imli (tamarind) — also known as aamli and “Indian date — has a delicious sweet and sour flavor and is a versatile ingredient. It can be eaten raw as a bean, used for flavoring like a spice, and enjoyed as chutney, a condiment, and even as a refreshing beverage. This my favorite pickle relish of all time and doesn’t last long in my house AND I’m the only one who eats it. Add ground chilies to a bowl together with the salt, turmeric powder, ground mustard, methi and jeera and crushed dried red chilies. Toss. Soak tamarind in boiling water for half an hour. When cool squeeze out the pulp. Boil vinegar, sugar and tamarind together until thick like a sauce. Using a sieve, strain over the chilies whilst still hot. Add oil to pot, heat. Add whole mustard seeds, sesame seeds, and curry leaves. When mustard seeds start to splutter and curry changes colour, add garlic, toss for about 10 seconds, remove from stove and pour over chilies. Add the honey and sesame oil, toss well and leave to cool before bottling. NOTE: Remember to press your pickle down in the bottle every day to tightly compact it as air pockets can make it spoil. This helps the oil to rise to the top of the bottle. Make sure your pickle has a generous layer of oil covering the top to prevent it spoiling.